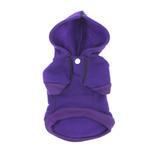 Your workout buddy can now look as athletic and fashionable as you do in their own Sport Dog Hoodie in Ultra Violet by Doggie Design! 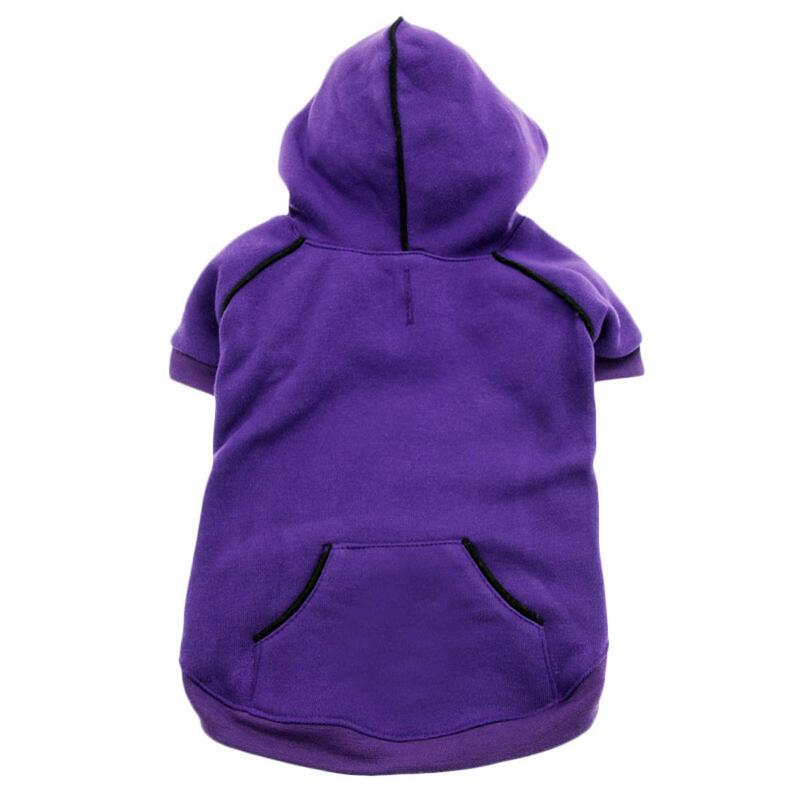 As a trendsetter in pet fashions, Doggie Design has updated the basic hoodie with fashion-forward accents that will get your dog noticed. The crisp, black piping and the Doggie Design Sport logo look super sharp against the purple fabric. Style doesn't take a back seat to comfort, though. The 35% cotton 65% polyester knit fabric is a nice weight, slightly stretchy, and is breathable. The Sport Hoodie has been designed to fit comfortably and not be tight. Soft ribbed trim ensures an easy fit. 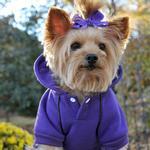 Sport Dog Hoodie by Doggie Design - Ultra Violet Customer Photos - Send us your photo! Zuzu grew out of her pink and blue sport dog hoodie in XS, so we bumped her up to a size small, but she still only weighs just under 3lbs! She looks great in the ultra violet! Posted On 07/18/18 by Miss Pittsburgh from Clinton, TN Yes, Miss Pittsburgh recommends this product! Soo cute but will have to wait until she grows into it. I ordered a Medium and still a little big. Posted On 07/08/18 by Karina from , Yes, Karina recommends this product! Your little one can be warm for the winter. Posted On 03/26/17 by RIta I from Chalfont , PA Yes, RIta I recommends this product! Posted On 12/20/16 by Karen S from Cedar Springs, MI Yes, Karen S recommends this product! THIS sweatshirts is the most rich purple I have ever seen. Can not wait to see all the new 2017 clothes..
Posted On 12/01/16 by MICHELLE R from Dayton, TX Yes, MICHELLE R recommends this product! super cute and warm, a 'small' was almost too tight for my maltese, but I think it would fit better if she was in a 'puppy' cut. She has a long 'show' coat now. Posted On 10/23/16 by Deni S from New York, NY Yes, Deni S recommends this product! Our teacup poodle looks amazing in her sport dog hoodie. The ultra violet color is so flattering. The small fits her perfectly. She weighs almost 3 lbs. Posted On 03/19/16 by VICKI J from Bronx, NY Yes, VICKI J recommends this product! 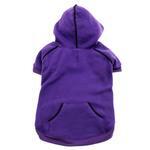 I purchased this for my little munchkin Coco Chanel and it looks so adorable on her. She is a black Cavalier King Charles Spaniel/Shihtzu mix and this color looks great on her. I purchased multiple colors for her. I couldn't resist. I also purchased some for her brother Chulo who is a Shihtzu/Bichon mix. Posted On 03/15/16 by holli t from Hale, MI Yes, holli t recommends this product! We're loving our new hoodie. It's so comfy and warm yet light weight enough for the spring weather. This is the fifth sport hoodie we've purchased. Love that we can alternate the hoodies depending on what color we want for the occasion. Thank you Baxter Boo for being our favorite place to shop for doggie and kitty items. Posted On 03/11/16 by Alex C from Seattle, WA Yes, Alex C recommends this product! Posted On 12/05/15 by Sonya H from Westerville, OH Yes, Sonya H recommends this product! This hoodie fits my Chihuahua great. He already had the Nautical Blue. I liked it so much that I wanted to get another one. It seems well made and is warm. Posted On 11/25/15 by Gary L from Colleyville, TX Yes, Gary L recommends this product! Good fit, good quality - 2XL fits great on our goldendoodle. Posted On 11/11/15 by Cres B from Oak Park, IL Yes, Cres B recommends this product! Every dog needs a sport hoodie. Max is the typical macho terrier whose motto is I don't need no [stinkin] coat. He has no undercoat, however, so unless he is racing around, he gets cold. Like when he is walking ever so slowly with me (boring). He likes the sport hoodie; it doesn't apparently fit the dreaded coat category. It fits on smoothly and stays comfortable without riding up. And he looks Cool! Posted On 10/09/15 by Michael from , NY Yes, Michael recommends this product! I bought an XL for my 60 lbs pit and it fits her great. 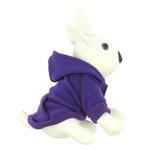 Its a really nice hoodie, perfect for this cool fall weather!! Posted On 02/06/15 by Jenn B from Marion, OH Yes, Jenn B recommends this product! This is an adorable hoodie but, it does run small. I ordered a medium for my 14 pound Shih Tzu and it was too small. I am waiting on the large to be shipped and hope it fits perfectly. Posted On 12/22/14 by Robin W from Topton, PA Yes, Robin W recommends this product! Love this hoodie! I recently purchased 2 of them. This purple one I purchased for my female. Once I got it on her, she seemed to really like it. She has shorter hair and I thought it would be nice for cooler days. The color is great and the style is fantastic. Fits perfectly! I would surely recommend it to others! Posted On 12/20/14 by Brenda H from , IA Yes, Brenda H recommends this product! Very nice quality. However runs at least a size big. Posted On 11/21/14 by Emily from , Yes, Emily recommends this product! Posted On 11/05/14 by Terri J from , Yes, Terri J recommends this product! Have one in black too! Review there, but wears and washes well. Seems to keep our dog nice and toasty warm! Posted On 10/09/14 by Lisa L from Millersville, MD Yes, Lisa L recommends this product! After last winter, I was looking for something warm for Tank to wear. It isn't easy to find clothes to fit my Staffie. He is 75 pounds of solid muscle with a 30' chest and 22' neck. This hoodies fits him perfectly. Would highly recommend it. Posted On 10/08/14 by Ryan M from Chesnut hill, MA Yes, Ryan M recommends this product! Prices were great, easy to order and had what I was looking for! !